...a well written and content rich book. From a teacher's perspective, using this book in an advanced project management seminar challenges students to understand the application of these concepts. Widely acclaimed as one of the top agile books in its first edition, Project Management the Agile Way has now been updated and redesigned by popular demand. This second edition is in a modular format to facilitate training and advanced course instruction, and provides new coverage of agile, such as hybrid agile methods, the latest public sector practices, and a chapter dedicated to transitioning to agile. It discusses the grand bargain between project management and business; the shift in dominance from plans to product and from input to output; and introduces new concepts such as return on benefit. 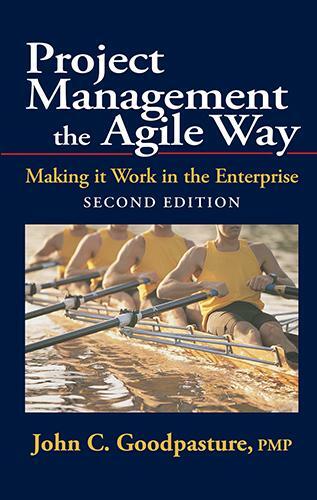 Experienced practitioners and students that want to learn how to make agile work effectively in the enterprise should read this book. Individuals preparing for the PMI Agile Certified Practitioner (PMI-ACP) examination, and training providers developing courses, will find this second edition quite helpful. John C. Goodpasture, PMP, is a leading expert and program management practitioner, coach, author, and consulting manager for technology projects. Mr. Goodpasture is an accomplished quantitative risk manager, expert in cost/schedule estimating, and contract and sub-contract management. He is an experienced instructor of Agile methods, risk management, PMP prep, and quantitative methods. John is a skilled speaker, and published author of several books, and numerous magazine and journal articles and papers. He has engineering degrees from both Georgia Tech University and the University of Maryland. He is currently the Managing Principal at Square Peg Project Management Consulting and he gained his previous practitioner experience as a strategic project office director and systems engineering program director for Harris Corporation, as a program manager for the U.S. Department of Defense, and as vice president of a large document imaging company.